The ‘Marble Earth’ furniture range plays with our appreciation of chipboard furniture that has a decorative top layer. We tend to like it because it is cheaper than solid wood furniture, but it has an aura of discount brochures and mediocrity because it is usually covered up with wood imitation prints. Why stay with a ‘birch’ cupboard door? An ‘oak’ kitchen work top? Why not embrace the potential of the material? Bart Joachim van Uden re-imagines our self-deceit. 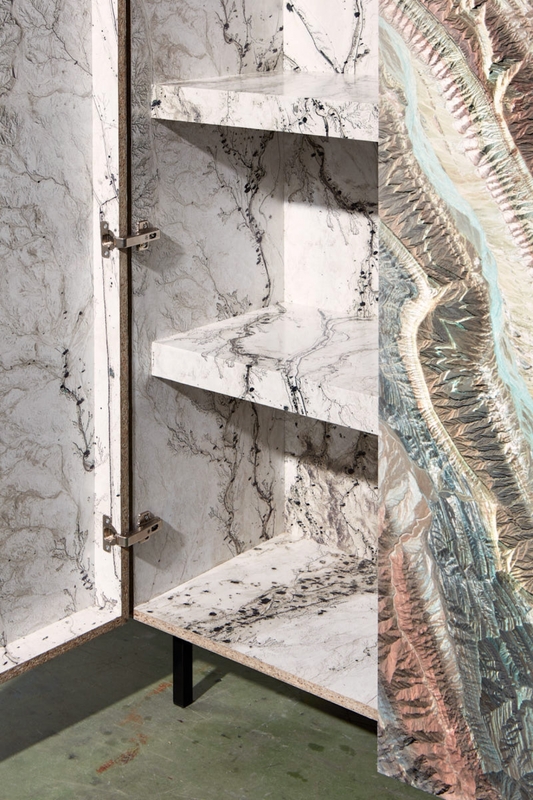 He uses images from Google Earth, selected to look just like exclusive natural stone, and combines them with the esthetic details of standard furniture production.